Rabble founder, Charlotte Roach, hasn't experienced your typical start-up journey. While on the way to Olympic success, she was caught up in an accident which dashed those chances. Still wanting to remain involved in the sporting world, she was inspired to start up her own company to make exercise accessible and enjoyable for all. We caught up with her to find out more about Rabble, and why the company has chosen to crowdfund now. 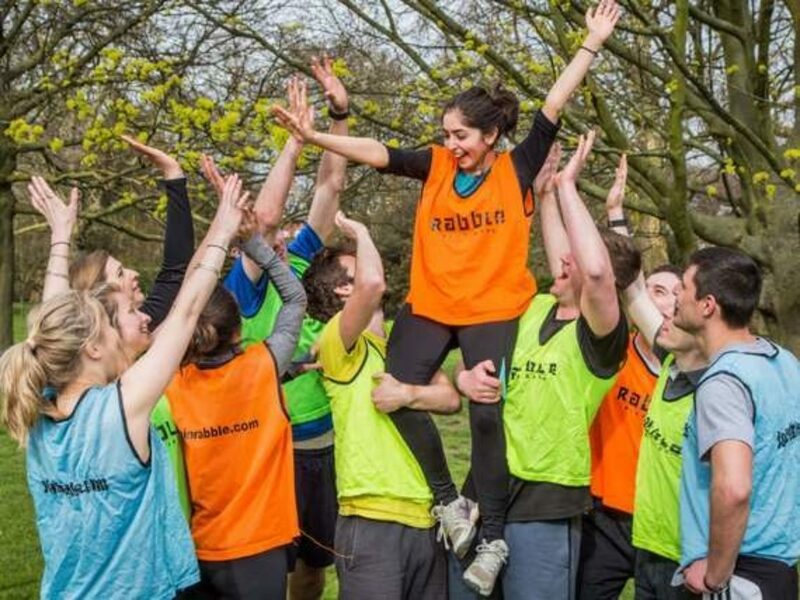 Rabble is a game based exercise programme that focuses on making each session so much fun that it doesn’t feel like a workout, so social that feels like a family and accessible to anyone who wants to join in. We achieve this by creating games that disguise exercise principles in their aims. For the player, the session feels like playing a series of games with your friends. It’s a positive, personal, purposeful workout where you don’t count down the seconds until the end and also make friends and engage with exercise for life. What were you doing before you founded Rabble, and what inspired you to start up on your own? I was always one of the kids trying to get people to join playground games, and I loved the freedom of losing yourself in the game. Unfortunately, after I left primary school, exercise became all about performance, whether you’re good at sport or who is going to be on a team, and much less about long term mental or physical benefits. Later on, I started competitive running and swimming, and in 2009 I left university in my second year to join the triathlon squad for the 2012 Olympic Games where we worked out 30 hours a week with only one day off a month. Then, six months into training I fell off my bike into the path of an oncoming car. I had broken my collarbone, 12 bones in my back and punctured both lungs. The doctors thought I wouldn’t make it. I wasn’t able to compete, and this made me feel so lost as I had always defined myself as an athlete and had never done anything else. After my accident I came back to university, completed my neuroscience degree and began working in London. I had imagined that exercise without a performance goal would be enjoyable again, but I was surprised to find it still very much felt like a chore. The fitness industry’s products are currently, on the whole, quite lonely and unenjoyable, whilst the sports industry is quite inaccessible to most people. We are bringing the best of both together. There are currently no games based fitness classes available in the marketplace. We are focused on ensuring that participants engage in purposeful, enjoyable, sociable activity that is something they can look forward to. Our community is a core part of Rabble. We felt that this type of investment opportunity would be a perfect way to give our community the chance to own a part of Rabble and join us on our journey to make exercise the highlight of the day. What has your business achieved to date? Furthermore, in the last year we have grown to over 130 licensed instructors, launched our first site in Australia, and received a lot of national coverage including features with The Guardian, Channel 5, BBC, Daily Mail and many more. We are looking forward to the next year, and with the investment we will be able to accomplish so much more! First of all, we want to be able to deliver the best possible user experience both online and offline. This means we will be focusing on our brand, our instructor training and our reach. We are also hoping to build many more meaningful communities and change more lives through fitness. Find out more about Rabble and invest by visiting their pitch page.